The 2017 holiday season is already shaping up to be highly promotional. 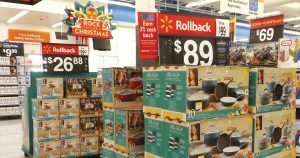 Wal-Mart Stores, Amazon and their competitors seek to woo consumers with price rollbacks, with Wal-Mart already rolling back prices on more than 400 toys, in addition to hundreds of general merchandise items and grocery. Consumers shopping Black Friday found the deals were promotional at Wal-Mart, with savings like $80 on the iPad 5th generation tablet or $100 savings on the latest iteration of a Nintendo videogame console. This came on the heels of earlier savings which were advertised by Wal-Mart in early November. Boyd Evert, president of Harvest Revenue Group in Bentonville, told Talk Business & Politics-Northwest Arkansas Business Journal rollbacks and price promotions, while they generate store traffic, also raise risks for suppliers. He said third-party auditors will review sales data soon after the holidays on behalf of Wal-Mart and other retailers, looking to write post-audit claims. He said Wal-Mart has the ability to act with increased independence and is free to change the retail price below the funded rollback rate by suppliers, and this creates pressure on margins. He said over the past 12 months the conversation between retail buyers and suppliers has been about both parties lowering prices so Wal-Mart can maintain price leadership against its toughest competitors. “Suppliers are saying they are pouring money into funding these lower prices which go above the terms and conditions they negotiated two years ago,” Evert said. If a supplier sells a product to a retailer for $1 with a suggested retail price of $1.50, the retailer can sell it at any price they like, even below cost to match a competitor. He said over the past four years, Harvest Revenue Group has seen more post-audit charges from Sam’s Club and Wal-Mart where the retailers dropped the price below their cost. He said suppliers have been charged for the difference between the sales price and the $1.50 suggested retail price. Audits triggered by Black Friday are a concern for suppliers and for good reason, Evert said. Two years ago, he said one supplier got the Sunday paper and saw their product advertised at a discount in the retailer’s ad. He said the supplier never negotiated the promotion. A year later they were hit with a post-audit claim which they had to fight. Evert said another supplier agreed to a Black Friday promotion and funded the discount, but also disclosed their margin on the agreement so the retailer would have that information. The retailer advertised and sold to the terms of the agreement, but the supplier was hit with a seven-figure post-audit claim based on an assumption of a guaranteed margin owed to the retailer. He said the claim was eventually reversed, but it took time and money to fight to the claim. Evert warns suppliers to be proactive and settle the holiday sales right away. They need to monitor what they agreed to and make sure that’s what happened. He recommends suppliers put an escape clause in their contract that allows an out if the terms are broken by either party. “We have suppliers who spell out that they do not want to fund a rollback. And we are seeing it pays off for suppliers to spell out what they will and will not pay for in the contract,” Evert said. 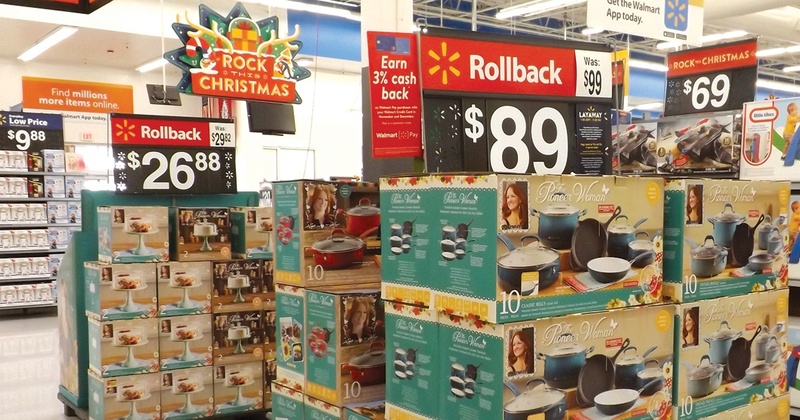 Hundreds of price rollback signs are visible in Wal-Mart this holiday season, with the company saying it has rolled back prices on more than 400 toys. He said the forward thinking is to document how the promotional events perform, and if the supplier margin isn’t what the agreement says, then it’s important for the supplier to email the retailer and defend their margin. Again, documenting what they are willing to fund and what they will not fund is the key. Evert said the blurred lines of retail are also complicating bookkeeping and generating more audits for suppliers. For instance, he said the online price and the in-store price are different at Wal-Mart, but what about items ordered online and picked up in store? He said it’s harder for suppliers to have clarity on who is getting credit for the sale and when there is a price discrepancy there’s a risk of an audit. He said about eight years ago there was a period of time when Sam’s Club was considered a competitor of Wal-Mart. For suppliers selling the same item to both retailers, there were post-audit claims over the price discrepancies between the two retailers even though the packaging sizes were different. Evert is concerned with Jet.com also being seen as a competitor to Wal-Mart, and there is a risk for claims if Jet.com sold a product cheaper than Wal-Mart, even if it was closeout items sold by a third-party marketer on Jet.com. Evert warned suppliers to watch holiday promotions with all their retail partners and double check them against the contracts. If there is a discrepancy, he said speak up right away and document the finding because a year from now when the post-audit team gets around to filing a claim, it will be harder to document and the buyer might not even be the same one who made the deal.